I am going to venture a bet that you all have all experienced that feeling. The one that started in the pit of your stomach, shortly after you entered a crowded room. Then came the immediate realization that something was “just not right” and perhaps it was best to go to PLAN B – bolting for the door. What was your first clue? Was it the whispering conversations? Or did you spot staring looks of disdain someone made towards another attendee? Perhaps there was one person who seemed to “be holding court” with obnoxious laughter and countless diatribes. This my friends, is what I like to call “Creating a drama effect”. A behavior(s) that is meant to make a significant impact in a group or situation for the sake of garnering power, controlling a situation, elevating a person’s level of self- importance or simply for “sport”. Moreover, the drama effect could happen when a person joins or participates in an association / club and ends up creating chaos. A calm event turns to calamity with one person shifting the mood with a single behavior. Sometimes we call that person the “Drama Queen” … but in all fairness… “Drama Kings” also can be in our midst. You have all experienced drama if you belong to any formal or informal organization, such as a PTO, sports league, religious organization or heck – even an online social group. I bet as you are reading this blog you are conjuring a face or name in your mind.. right now. No need to share. I already “know” that person and have “met” him/her before. You see, I guess I am old enough and maybe wise enough that I no longer need to be part of this “scene” as I have had my fill of drama. The take – away… if you are genuine to your true self you don’t need to surround yourself with drama. It takes a lot of guts to actually be the person you truly are – faults, flaws, and amazing traits! It also takes a lot of chutzpah to walk away from drama. I am nothing but filled with chutzpah – for sure! Accentuate the positive in a person even when they don’t say positive things about others. 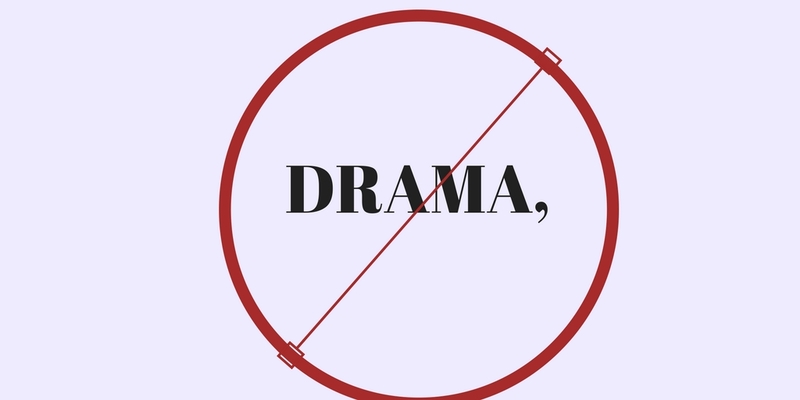 If that is too hard to do – walk away to a “no drama” zone in your environment. Sadly, people who create drama usually don’t stop easily. So, for your own emotional health – don’t engage, but simply walk away. Offer to be a helper and a doer vs. a hinderer or taker. Stop the blame game by stopping to look in the past. You aren’t headed that way – so leave it there. In closing, I am not writing this blog to point fingers, but simply to shine a light on a prevailing theme in our world – that we tend to accept powerful and popular people who create drama, despite it being a negative response to a situation and that has no real purpose.